Internships are key to getting a great job after graduation. Students explore career options, pursue academic or personal interests, acquire practical experience, and make connections. Our decade of classes has committed to raising funds for internships. Our gift will become part of the overall MiddAction Fund, which supports experiential learning. We are starting with a goal of $20,000, but our hope is to raise as much as possible to support internships for Middlebury students. 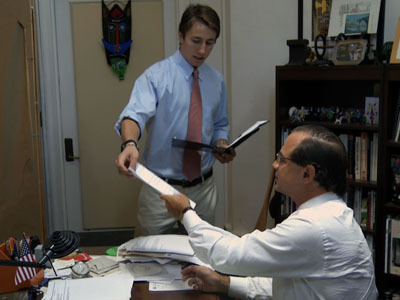 Addison DiSesa ’12 wanted an internship aligned with his environmental ethic and interests as a political science major. At the New York City Department of Parks and Recreation, he worked as assistant to Commissioner Adrian Benepe ’78, P’09, P’14. The experience gave Addison exposure to the world of public service and the chance to test out a potential career path. The College has committed to ensuring that each undergraduate has at least one opportunity to acquire practical experience that furthers his or her aspirations and educational objectives. These experiences enable students to develop the skills they need to succeed while also exploring potential career directions, making contacts that will assist them in finding that first job after graduation, and fulfilling their potential as engaged citizens. There are many resources on campus to help students find opportunities that fit their goals, interests, and passions. But often students are unable to take advantage of such opportunities, either because they cannot afford to work as unpaid interns or volunteers or they do not have the money needed to cover the cost of their self-designed project. To ensure that all students can participate, Middlebury has created an endowed fund called the MiddAction Fund to support student experiential opportunities in the summer and during winter term. We all know it’s a tough job market. Let’s help Middlebury students get a jump start on their careers! What a fantastic initiative! Many college students have to work during the summer to cover costs, so they cannot even consider unpaid internships. Providing scholarship assistance will enable more students to benefit from the invaluable experience and network built during internships.